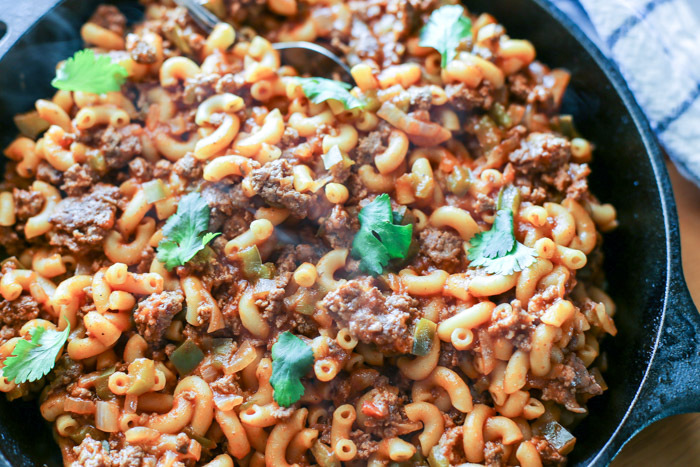 This skillet macaroni and beef recipe is packed with flavor! 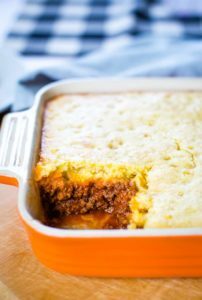 An easy weeknight meal, it is made with tomato sauce, ground beef, green pepper and onion. 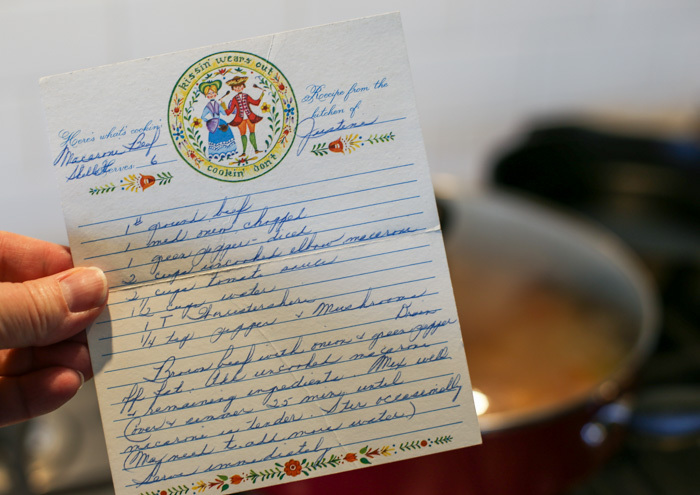 When searching through our family recipes I stumbled onto this macaroni and beef recipe that brought back memories of my mom cooking on her electric skillet. 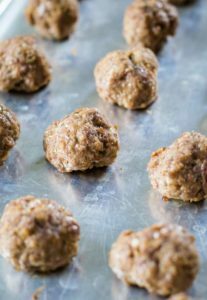 The flavors were immediately in my brain and I knew I had to make it right away for my family. My boys love anything with tomato sauce – seriously. Anything. And while I don’t own an electric skillet, our cast iron did just the trick – as well as our regular ol’ cooking pan. 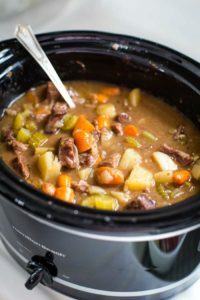 Nothing fancy in the kitchen utensils department is needed to make this simple and hearty weeknight meal. 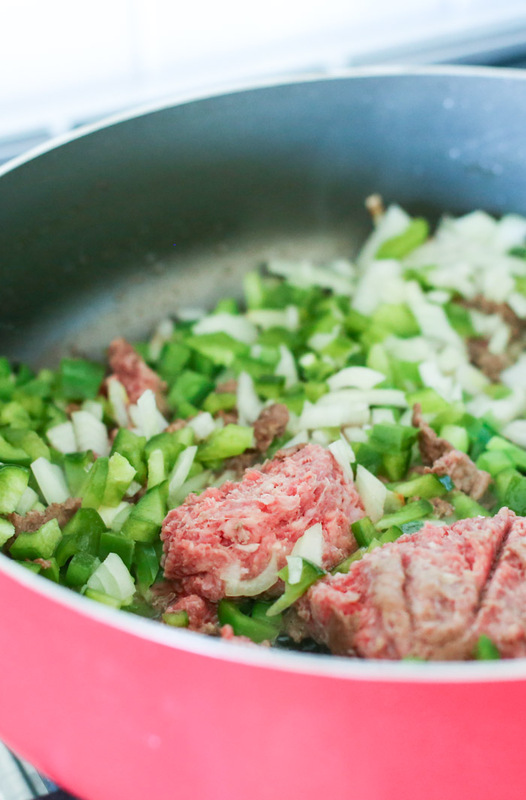 Brown the ground beef, onion and green pepper together in a large skillet. Anything that starts out with onion in the pan always turns out amazing. Am I right? The best part about making this recipe is that the elbow macaroni cooks in the recipe soaking up all those flavors as it bubbles away. 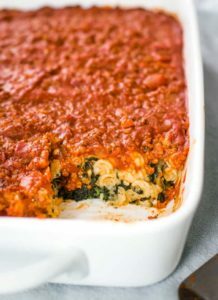 I think it’s one of the reasons I love this recipe so much and why it packs so much deliciousness. Step 2 – Add all the remaining ingredients into the skillet and simmer. Mix it well and cover to simmer for approximately 25 minutes or until the macaroni is tender. Don’t be afraid to take a bit to test – yum! You will want to stir it occasionally and make sure your skillet is simmering gently and not too hot, so as to avoid burning. What results is a hearty meal of goodness that, as anticipated, was a huge hit with my boys! 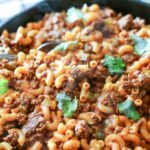 I hope you enjoy this timeless macaroni and beef recipe with tomato sauce as much as we did! 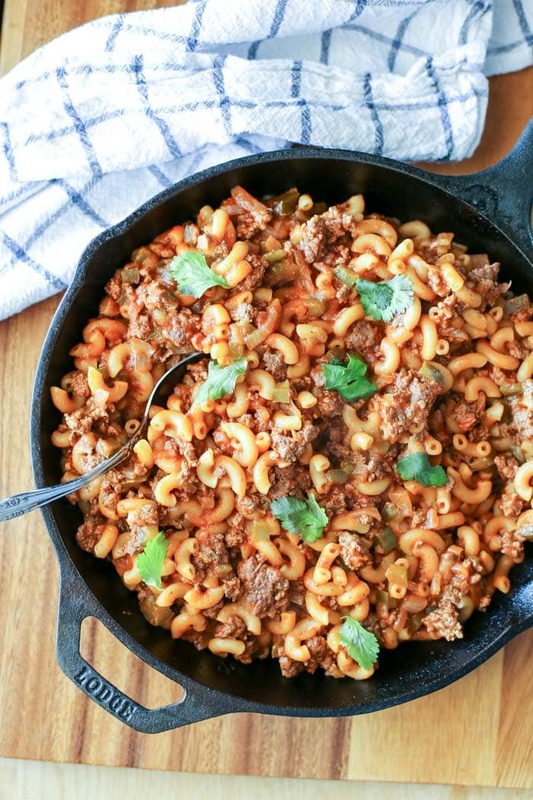 This skillet macaroni and beef recipe made with tomato sauce is an easy weeknight meal that is done in less than 30 minutes! Brown beef with onion and green pepper. Drain fat once fully cooked. Add uncooked macaroni and remaining ingredients to the ground beef mixture. Mix well. Cover and simmer for 25 minutes or until the macaroni is tender. Stir occasionally. 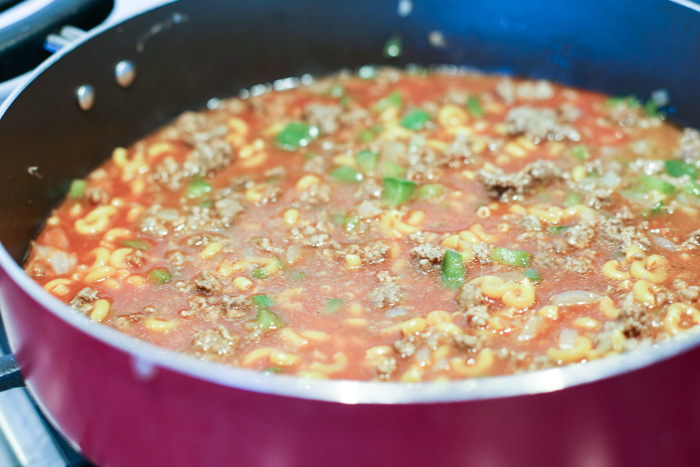 As the macaroni and beef simmers, you may need to add a little water towards the end if you need more cooking time. I didn’t find that I needed to, but keep it in mind if you find that your sauce is too thick to allow the macaroni to fully cook.